With the release of “The King’s Speech,” stuttering has become a topic of conversation unlike anytime I’ve known in the past. Two of the WCATY students that I interviewed for my book on parenting smart kids had been stutterers. The first is Angie, whom I’ve written about in previous columns. She was born a crack baby. She came to my attention when she scored a perfect 36 on the ACT English test as an eighth grader. It was from her father and eventually her that I learned of her challenging beginnings. By the time she first came to a WCATY program following her eighth grade year in school, there was no sign of a language problem – and who would have expected it from someone whose talent was so clearly language related. I’ve recently written about Rand’s ADHD. Rand’s second difference is his stutter, which was very noticeable when he was a high schooler attending WCATY programs, yet barely perceptible when I was interviewing him as a Ph.D. candidate. “When I was really young,” he explained, “specialists worked with me. Then my parents were told it was essentially gone, that I no longer needed to work with the speech teacher. My parents believed it and dismissed stuttering as a problem that had been solved. However, occasionally my stutter was still there, and as other students noticed small stuttering and made fun of it, it got worse again. In high school, I again took speech therapy. Rand no longer worries about his stuttering as long as no one points it out to him, or unless he becomes stuck on a word for more than five seconds. When I mentioned that I could barely detect a stutter as we were talking, but brought it up because of the palpability of the problem earlier, he explained, “It doesn’t happen anywhere near as often now that I have matured and am more confident about what I am saying. I rarely stutter when I am teaching or giving a speech, and I consciously slow down when I am working one to one with a foreign student.” I don’t think he had consciously slowed down his speech with me, but his confidence and maturity were clearly evidenced in his smooth flow of talking. And this was a confidence in himself, not just in mathematics – his area of expertise. I’m on vacation in the Caribbean, but I got to talking with someone about adults with Attention Deficit Disorder (ADD). I don’t think I’ve written much if anything on ADD or ADHD on this blog, so here goes – the story of Rand. He was identified with attention deficit disorder (ADD) and struggled in school because he looked at the world in a different way. As an adult, Rand thinks his ADD has made him the creative and productive thinker he is today. Rand talked with me about his differences at age 25, elaborating on their effects on his life as an adult, and the implications they have for children. He says he doesn’t ordinarily tell people he has ADD until he knows them fairly well. “First, I don’t consider it a disorder. Second, people generally associate ADD with hyperactive adolescents. I recommend the book Driven to Distraction: Recognizing and Coping With Attention Deficit Disorder from Childhood Through Adulthood, by Edward M. Hallowell, M.D. and John R. Ratey, M.D., for those who want to understand more about ADD. ADD in adulthood is no different than it was in childhood, except that adults have [often] learned coping mechanisms and thus handle it better. “I have what is now called ADHD, but without the hyperactivity. I think about that a lot. To say that I have no hyperactivity is actually wrong. If you look closely, you will notice that I am fidgeting. I always fidget, but I am not noticeably hyperactive. This is why at first they didn’t think I had ADD or ADHD, whichever you want to call it. It’s even harder for girls to be identified because they often don’t show the hyperactive signs. “Calling ADD or ADHD an attention deficit is misleading. Actually I have too much attention. For example, if I am reading a student’s paper, I will be focusing so closely that when someone says something, I’ll jump sky high. It’s called hyperfocusing, which means you can get a lot done because you’re not focusing on anything else. It also makes you impulsive. You can get stubborn about going down a blind alley. So, hyperfocusing is a two-way street. Sometimes it irritates others or blinds you to tasks you should be doing. At other times the focusing works advantageously. “The flip side of hyperfocusing is distractibility. When this trait is working well it is akin to free association. I can connect A to B when they don’t appear to be related. Because you are thinking about so many things at once, you are able to connect things that no one else sees. I always have about five different threads of thought in my mind; if I am working on a math proof, I’ll have three threads of thought working on the proof itself, one working on what I’m trying to prove, and one finding the problems with what I’m doing. It’s parallel processing. People with ADD understand this, but people without it usually can’t relate at all. This trait has been very helpful to me. “If somebody told me now that they could take away my ADD, I wouldn’t do it. My medication helps me control the negative effects. I like my ADD as long as it is being controlled. I don’t know anyone else who is able to think about five things simultaneously. I like being able to hyperfocus too. I like being able to control when I do what, and that’s what my medicine helps me to do. ADD has its great sides, as well as its bad. Creativity is one of the largest positives. Thinking back to childhood, Rand continued, “Throughout my childhood, I had to have the guts to tell everyone, ‘You are wrong! Just go away and leave me alone.’ My parents aren’t included in the ‘everyone.’ If they had been, I don’t know what would have happened to me. If I had listened to ‘everyone,’ I would have been in danger of becoming what they thought I was or should be. “Now, it’s not everyone that I have to convince of my abilities. People sometimes say, ‘How did you do that! It’s strange, but if it works, okay.’ I have the credentials and confidence to prove that I know what I’m doing, and people believe me. Accept that you are not like everyone else and be happy about it. Who wants to be like everyone else anyway? Don’t listen to others when they tell you you’re not smart. It doesn’t matter what they think. It just matters what you think. There are going to be difficult days, but you will survive them. Recently someone suggested I should be writing an adult book in addition to children’s books on the issue of being smart. My response was that my original plan was to write a parenting book on raising smart children. And, I did. 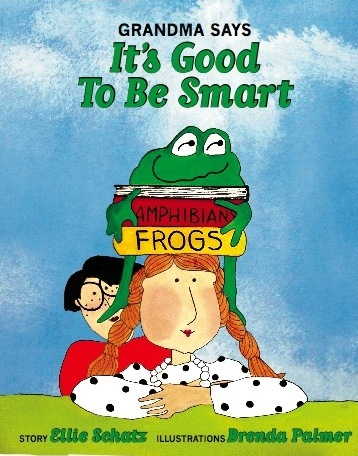 THEN I wrote “Grandma Says It’s Good to Be Smart,” believing that I could essentially put chapter one of the adult book into basic terms for small children, including my grandchildren. Now I am working on a children’s book on diversity and kinds of talent based on later chapters of that manuscript. I did not publish the adult book for two reasons. First, it is not about raising gifted children, but rather intended for a broader audience. I believe there are far more smart children out there than we admit. We are losing potential solutions to serious problems when we ignore this fact. And, we are not encouraging children to be all they can be. I’ve never subscribed to the Lake Wobegon idea – “where all the children are smart” – but I do advocate something much closer to this Garrison Keilor paradigm than what now exists in our schools and communities. Because of this philosophy and the broad approach I take to the topic, my manuscript is not a perfect fit for publication in the field of gifted education. Second, the market for books in general has been steadily declining. And books about a field as specific as talent development are not in high demand to start with. At the same time, the market for online materials is exploding. My conclusion? I’ve decided to remake the tips section of my blog into something potentially of greater interest to my readers (and in full recognition that I really had done next to nothing with it up until now). I have published the table of contents of my parenting book on the tips and preview page of this blog. You will need to help me take the next step. One possibility would be to post some of the stories in the book, based on your requests. Another would be to send a chapter to someone with the desire or need to read a specific topic. Another would be to excerpt information or data based on your requests or questions. Please let me know if and how this might be of interest and use to you and we’ll take it from there. I’m excited to have the opportunity to read and sign my books at one of the most popular sites that grandparents visit with their young grandchildren in Madison – Ella’s Deli. Please bring your young children or grandchildren to visit with me and get their personalized copy of the book between 5 p.m. and 6 p.m on the 14th. Recently someone inquired as to whether there were really different kinds of smart. I think the problem is with semantics. We probably all intuitively feel there are different kinds of smart, yet we don’t necessarily align our definitions of talents or abilities with the idea of being intelligent. In 1983, Harvard psychologist Howard Gardner published a book entitled Frames of Mind[i] that opened a whole new way of looking at intelligence. It’s not, according to Gardner, a narrow ability to think that is measured by a paper-and-pencil test. Rather, it is a multiplicity of abilities, all of which can be assessed, and which –when developed – can lead to different forms of achievement as well as feelings of success and happiness. In this book, Gardner delineated the following kinds of intelligence (or smart): linguistic, musical, logical-mathematical, spatial, bodily-kinesthetic, and the personal. He went on to expand his theory to include eight intelligences, the personal intelligences defined as interpersonal and intrapersonal and with the addition of a naturalist intelligence. Another researcher, Thomas Armstrong, changed the way teachers viewed intelligence in the classroom by writing books and articles that took Gardner’s idea from theory to practice. Armstrong also wrote a book entitled You’re Smarter Than You Think[ii] that translates the multiple intelligences theory into simplified language and explanations for kids. I am currently working on a book for still younger children that does the same thing. Armstrong explains 8 kinds of smart: Word Smart (Linguistic Intelligence), Music Smart (Musical Intelligence), Logic Smart (Logical-Mathematical Intelligence), Picture Smart (Spatial Intelligence), Body Smart (Bodily-Kinesthetic Intelligence), People Smart (Interpersonal Intelligence), Self Smart (Intrapersonal Intelligence), and Nature Smart (Naturalist Intelligence). [i] Gardner, H. 1983. Frames of Mind: The Theory of Multiple Intelligences. Basic Books, Inc. New York. [ii] Armstrong, T. 2003. You’re Smarter Than You Think: A Kid’s Guide to Multiple Intelligences. Free Spirit Publishing. Minneapolis, MN.